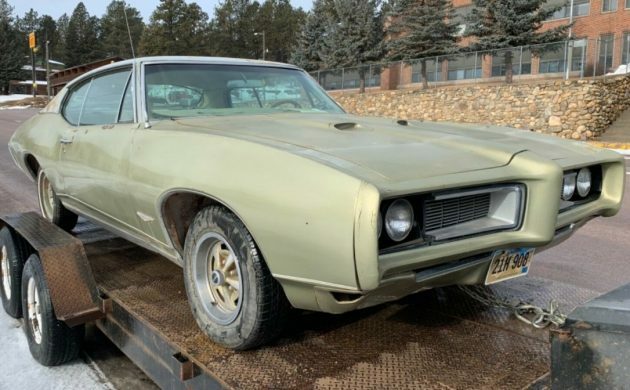 The term “numbers-matching” always has a high level of appeal when people are discussing classic cars, and not only is this 1968 GTO quite a desirable car, but it is also a fully numbers-matching car. 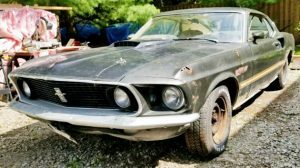 That fact, coupled with the fact that the car is essentially solid, makes this a great candidate for a restoration project. Located in Rapid City, South Dakota, it is listed for sale here on eBay. The GTO is looking a bit crusty, but below that, it is a pretty solid car. 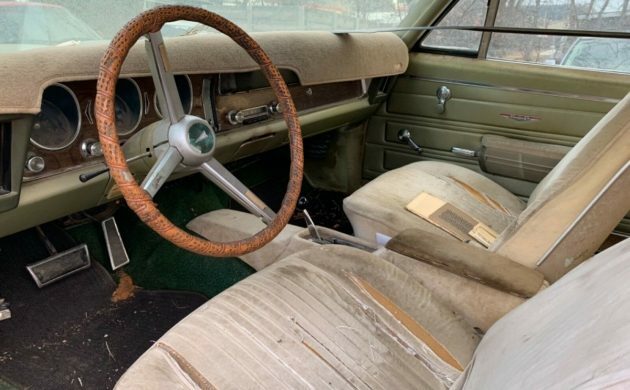 The owner says that apart from surface corrosion, the only actual rot in the body is a bit in the trunk floor where moisture was trapped under the rubber mat. The damage to the front fender was inflicted when the front wheel decided to make a fairly unsuccessful bid for freedom. The rest of the car appears to be straight and complete, and I have to say that I will always have a soft spot for any car that has hideaway headlights. The owner is also happy to include the original Rally wheels, although the one that decided to part company is now bent. The GTO is fitted with a 400ci V8 engine, a TH-400 transmission, and a Posi rear end. All of these components are numbers-matching, and the car not only starts, but it runs and drives. It isn’t roadworthy, and there will be some work to do before it is. 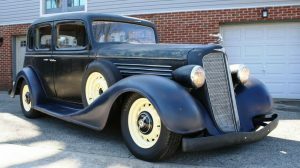 The owner says that you can tell that the engine is starting to get tired, but it would be interesting to see how much happier it would be with a carb rebuild and a good tune-up. The GTO also brings power steering, power brakes, and air conditioning to the party, making for a really nice combination. The good news just keeps coming, with the interior of the GTO appearing to be complete and unmodified. I will admit that it is going to need more than a little TLC, but at least you would have something to work with if you bought the car. There are a few items and features that I like in this GTO, but my favorite just has to be that Hurst “His n Hers” shifter. As a guy who grew up in Australia, this is one of those really cool features that the Americans got and we didn’t (among many), and I’ve always felt like we were ripped off by that. Okay, so now we come to the bottom line, and that’s the price. This GTO is complete, it appears to be very short on rust issues, and it is a full, numbers-matching car. That makes it a prime candidate for restoration. 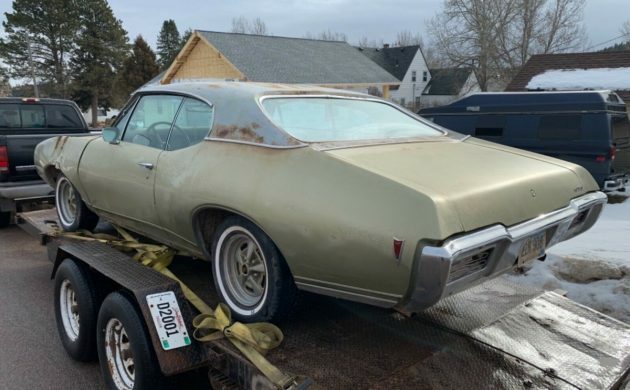 The simple fact is that anyone who has been reading about the cars here at Barn Finds for any length of time will have seen plenty of GTO project cars that need a lot more work, and have sky-high prices. This one is different, because it is solid, and the owner has not only set a BIN price of $9,500, but he is willing to consider offers. That makes this one quite a tempting proposition. What a flashback to 30ish years ago when these faded green (did they make other colors?) beasts roamed the streets of the Midwest, accumulating door dings, fender rot & saggging rear springs. 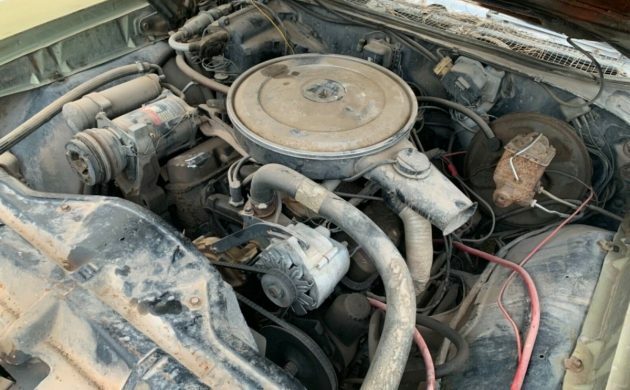 It looks like an honest used car they happens to be a Goat & likely represents a great opportunity for someone with time, discretionary funds & some skill to enter into the muscle car hobby. I’d jump on it if the garages weren’t already overfilled. It looks like an honest used car that happens to be a Goat & likely represents a great opportunity for someone with time, discretionary funds & some skill to enter into the muscle car hobby. Looks complete, I’d be scared to death of what might lie under the vinyl roof, Good luck to the new owner!! 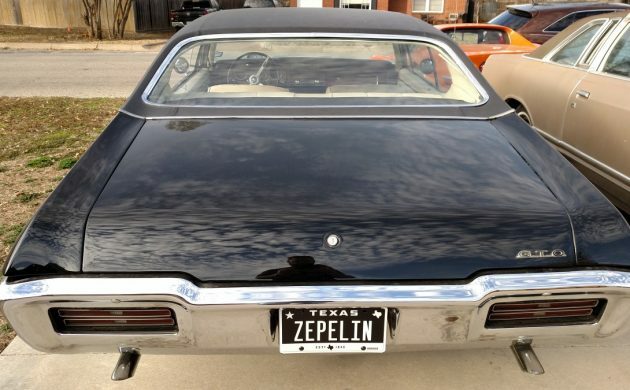 What vinyl roof? LOL Just a memory and the chrome trim around the sail panels and rear window. You are looking at what lay underneath. Yes, to me a very fair price for what this car is. 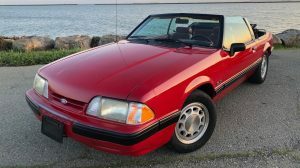 It is in my opinion a GREAT place to start especially if it truly is a solid CA car. Probably a REAL GTO. Engine is probably correct and matching. Even though it still needs everything BUT at least “WHAT YOU SEE IS WHAT YOU GET” which as I have said many times, I would rather know what i am getting that buying something that someone has done a half baked job on that will only be falling apart in the days to come. 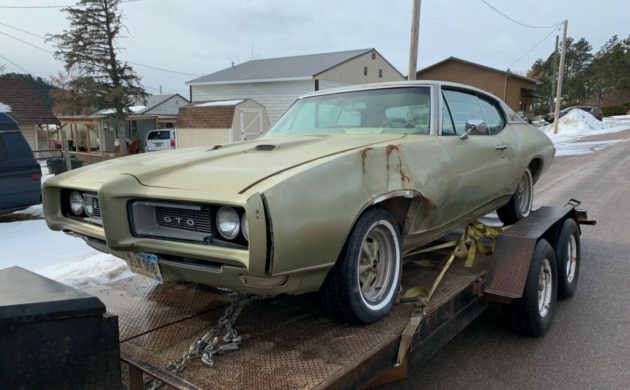 A rusty GTO will cost more than 10 grand just to redo the sheet metal and floors and other rust repair work which can be really costly if you start getting into the unibody, shock towers, sail panels etc PLUS the cost of buying a rust bucket to begin with which is always overpriced. 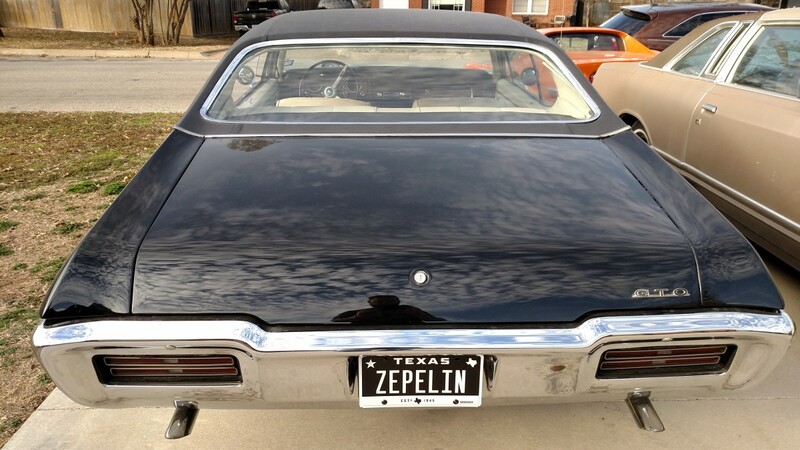 This is a GREAT car, a cult car and short of a 4 speed, a Rock Star to be made! 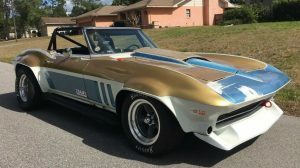 Changing the color on a Pontiac will NOT impact its value like a Corvette, in fact in this case, it will INCREASE the price. $10K & keep the change, in my opinion! If I had 10K I didn’t know what to do with right now I would already own it. There is a saying in engineering that there is no problem that is unsolvable if enough time and money are thrown at it. You can either take this to a professional or you can dismantle it yourself. Your best friends will be from Year One, Eastwood, and Harbor Freight. Whatever you choose, it can be a great family project. Looks like it’s pretty much there….well close to a good price….make an offer already !